Quite a while ago, someone on this forum shared a powder paint that looked to be "cracked"in its dried form resulting in a brownish, veined finish similar to a "Copperhead". I have exchanged PM's with Cadman and have verified it was not him. I would like to find this powder paint, or others, to try. I am looking for colors that are still nature-like, but different from the norm and standard colors used on jig heads and spinner baits. If you have any colors you would suggest (and especially if you know of or have the "Copperhead" color) please share it and the source where one might obtain it. Thanks, Allen. That's very interesting. As it turns out, Columbia Coatings is only 45 minutes from my house! I'll have to look into what they have. Looks like they are set up for industrial powder coating operations. I wonder if they would sell to a hobbyist? They sell it by the pound and I have been using it on my jigs for years. BOSS stuff works but they are expensive where as Columbia is like $15/lb. I have some I could trade but they are all basic colors. Click on Powder Paint then go to "Crinkle Colors." I particularly like their crinkle copper which I get in 1 oz. containers. They also say they'll custom mix colors. I've found both their products and service to be excellent. These look really good also! Just wondering, do these Crinkle Colors require any extra attention in applying or curing? Mike, I haven't noticed any difference in application, but there is a label on the jar that says, "Cure at 400º for 10 minutes. I can't do that because I cast a bismuth/tin alloy that melts at 395º. Cured at 325º for an hour, I can whack a head against my bench vise and not see any evidence of abuse. In the photo below, the color of the football is TJ's Crinkle Copper and the naked Poison Tail is Crinkle Penny. Only thing I have to add to this is those baits look great. 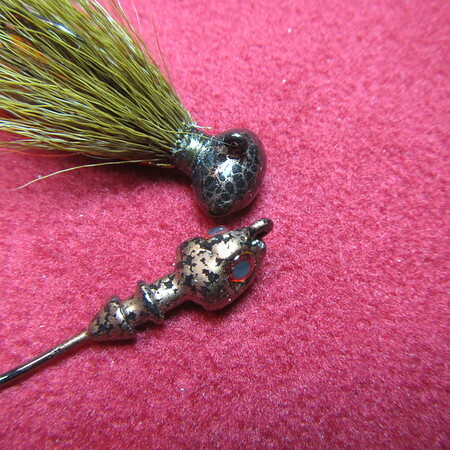 called "Copperhead" Have noticed it slightly changes it's antique finish with more or less heat. Good natural looking head.